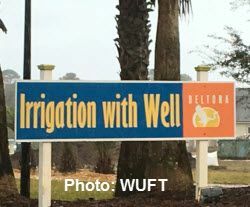 Water officials say that, added up, the impact of private irrigation wells may be significant in Florida. Lack of data keeps them from knowing for sure, and may be skewing the state’s rosy water-conservation numbers. In the Turnberry Lake development near Jonesville, private irrigation wells are a familiar sight in the backyards of many homes. When prospective residents come to view the neighborhood, they are given the option to add an irrigation well to their home site, alongside options like low-flow shower heads and LED light fixtures. Turnberry Lake, known for its sandy soil and grassy landscapes, consumed the most water out of 28 neighborhoods surveyed in the 2014 Envision Alachua report. While it’s landscaped with drought-tolerant Zoysia grass and many native plants and trees, a single-family Turnberry home averaged 538 gallons per day; that’s 73 percent higher than the county average of 308 gallons per day. With high water consumption comes higher water bills from the local utility — a factor that prompts some homeowners to seek alternatives for landscape irrigation. Private irrigation wells are one option. But water officials are beginning to worry about the impact private wells may have on water resources. Every well drilled into the Floridan Aquifer is like poking another straw into a drink; scientists say the cumulative sips contribute to the decline of the region’s springs and rivers. “If you have a really high water bill, but you still really want that green lawn, one alternative you have is to put in an irrigation well,” said Stacie Greco, Alachua County water conservation coordinator. Floridians use about 6.4 billion gallons of freshwater every day, according to the U.S. Geological Survey, a number that has dropped in recent years amid increasing efficiency, awareness and prices. In the city of Gainesville, water use has dropped 22 percent since 2007 despite population growth.